At Westbury Toyota, we make it a point to do a couple of things on a daily basis. First, we work very hard to ensure that each and every person who walks through our front doors is given the utmost attention, which means that we focus on each and every one of their needs when it comes to searching for a new vehicle. Second, we don’t forget about them once they drive off the lot. Our customers are our priority, so in the months and years that follow your purchase, we’ll always be here ready to do whatever it takes to keep your Toyota in top shape. While plenty of other dealerships might also lay these statements on thickly, the fact of the matter is that Westbury Toyota has the hardware needed to actually back up such bold claims. 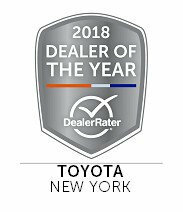 To prove this point and see why our dealership emerges a cut above the rest, you need look no further than the fact that Westbury Toyota has been awarded DealerRater’s 2018 Dealer of the Year Award for Toyota dealerships in the New York Area! What Is the “Dealer of the Year” Award? Every year, DealerRater makes a choice selection from all dealerships in North America and awards them their “Dealer of the Year” award. As explained by DealerRater, the award recognizes excellence in the areas of both customer service and satisfaction. DealerRater makes their decisions by examining customer reviews posted on DealerRater and acknowledging those dealerships that have acquired the highest ratings for both new and used car sales, as well as car maintenance. The reviews are evaluated on how they describe a dealership’s customer service, overall approachability, vehicle and service pricing, work quality, and of course the overall experience. To even be considered for this reward, a dealership must have acquired more than 25 reviews over the course of a year (with at least one review per quarter). The dealership must also have an average four-star rating (out of a possible five-star rating) and must not have been blacklisted at all during the year. It goes without saying that we’re pretty excited that we’ve met – and exceeded – all of these criteria! When you consider the sheer number of dealerships strewn across North America, being recognized in this manner is a huge accomplishment. There are a large number of dealerships who also excel at customer satisfaction, and to be named among the upper echelon of this group this year is a big achievement for Westbury Toyota! It also means that prioritizing you, the customer, and all the hard work we’ve put into this process is being recognized and appreciated. This is also the first year that we’ve has received this award, and it makes us even more determined to win it every year after this! What Does This Accomplishment Mean Going Forward? Given that our primary focus is to make sure that each and every person that walks through our doors leaves satisfied, getting an award of this nature validates all the hard work we’ve put into making our customer experience great for all parties involved. What’s more, it gives us even more incentive to work hard at keeping up with the industry-leading pace we’ve already set. With this in mind, you can count on us to keep focusing on providing everyone who comes to us looking for a new car with service and support that goes well above and beyond average expectations. We’re also going to make sure that our dealership name continues to be recognized for our commitment to excellence in the automotive marketplace. To say that we here at Westbury Toyota are proud of what we’ve accomplished in the last year is an understatement. It’s a great way to bring in the new year and it also sets a precedent for what we need to achieve in the upcoming months. We hope that this award from DealerRater brings to light our dedication to delivering the best customer experience – and if you’re curious to see just what kind of service correlates with such an impressive accolade, never hesitate to stop by and see exactly why Westbury Toyota stands alone across Long Island and the rest of New York as the region's most customer-friendly Toyota dealership.